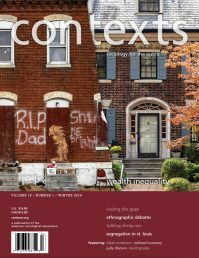 At least three sociological accounts attempt to explain why such massive heat-related death took place in Chicago during the second week of July, 1995. An epidemiological investigation, Eric Klinenberg’s book Heat Wave, and now the narrative play Heat Wave staged in Chicago this past spring. All three are sociological, two are interesting and entertaining, and one is accurate. As a sociologist and former theater and film student, I was curious to see the relationship between sociology and drama reversed, and I wondered if it was even possible to adapt a piece of research into a dramatic framework set for the stage. Ross Macmillan is in the sociology department at the University of Minnesota. His interests include sociology of the life course and social demography. E.C. Hedberg is a sociology Ph.D. student at the University of Chicago and a staff research analyst at the National Opinion Research Center. He studies intergenerational family exchanges and research methodology.